Word Find Mobile is a childhood Game brought to your handset that provides hours of eager searching to find hidden words in a maze of letters. The game will allow you to define the number of words that are hidden in each game board, set the colors of the text and the background, turn sound on and off, or show gridlines between the rows and columns. The game will determine the size of the game board according to the devices screen size, the size of the font for the game board and whether the current word list is displayed at the bottom of the game board. The game will build the game board by randomly selecting words from the available word list, then randomly select a direction for the word to be placed in the game board, i.e. up, down, left, right, diagonal up, diagonal down. 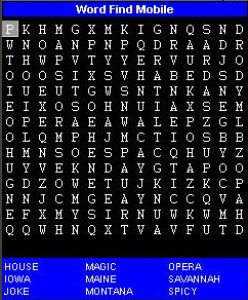 Once the number of words placed in the table matches the number selected per game, the game then fills in the empty slots with randomly chosen letters. This provides for an endless arrangement of game boards.